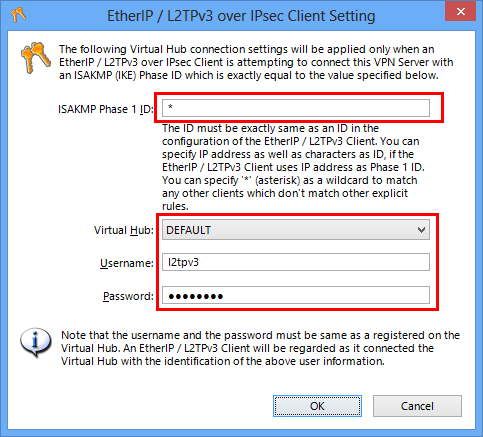 If you use L2TPv3 over IPsec, you can establish an IPsec-encrypted tunnel between the remote site's Cisco Router and the central site's SoftEther VPN Server. This web page explains how to setup a Cisco 1812 or Cisco 892 router to connect the SoftEther VPN Server. Why Cisco Routers with SoftEther VPN Server is the Best? The above link shows the advantage of SoftEther VPN Server with the combination with Cisco Routers. Before setup Cisco router you have to setup the SoftEther VPN Server settings. 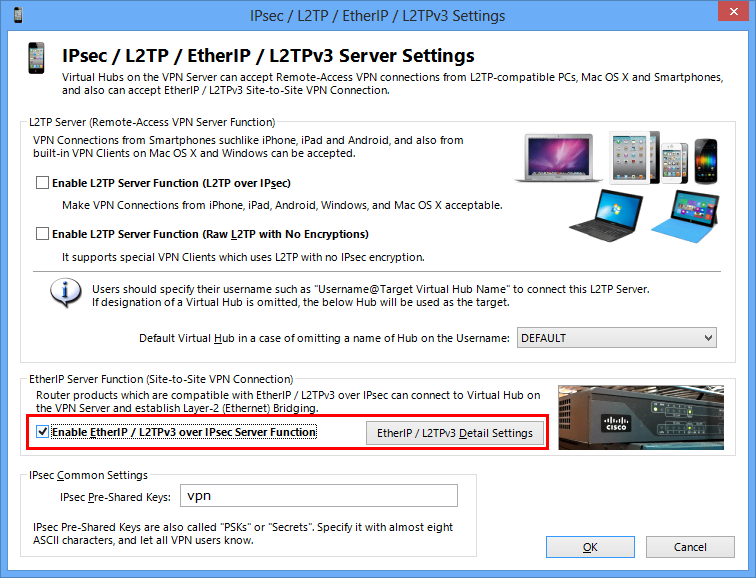 On the above screen, check the "Enable EtherIP / L2TPv3 over IPsec Server Function" and click the "Detail Settings" button. The following screen will appear. In this screen you have to define a mapping-table between L2TPv3 client (router)'s ISAKMP (IKE) Phase 1 ID, and the destination Virtual Hub's name, username and password. Essentially you should specify the Cisco's router's ISAKMP (IKE) Phase 1 ID on the ID field. However, you can specify "*" (wildcard) to match for any IDs. This is lack of security but this time is just a tutorial. So a wildcard is used. In the long-term running system you have to specify the Phase 1 ID exactly instead of a wildcard.